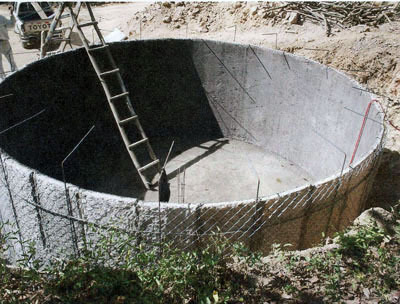 The Olentangy Rotary Club announces they have obtained another grant from The Rotary Foundation to build additional cisterns in 2011. 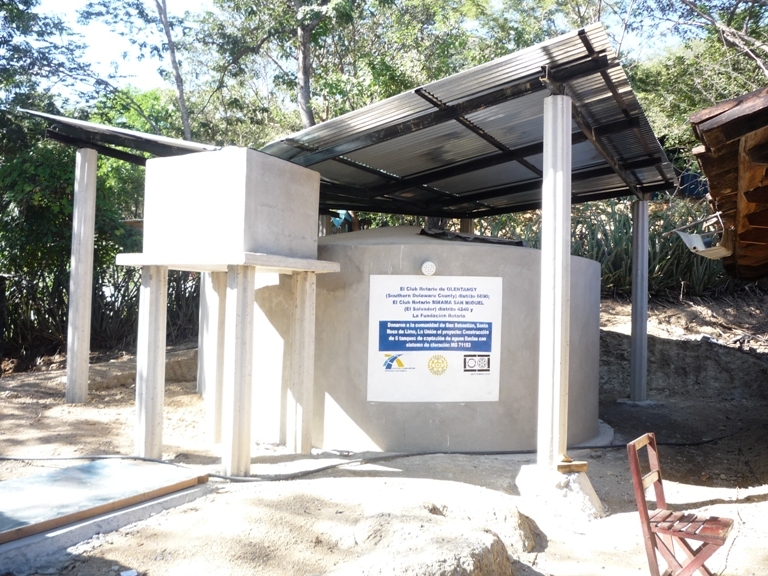 Funding for the 2011 cisterns was provided in part with financial support from the Rotary Clubs of Sirama, Lewis Center/Polaris and Barnesville. Seven Powell residents recently traveled to Chalatenango, El Salvador with Eye Care International. This was not a trip whose purpose was to soak in the natural beauty of the land, there was a more direct mission in play: to help the residents better take in the natural beauty around them and live their lives with improved sight. Eye Care International works to improve the vision of those living in the places they visit. Making the trip were residents John Medeiros, Rich and Jordyn Irelan (a Liberty High School graduate and current freshman at OU), Dr. Jason Miller, his son’s Jake and Josh (both students at Liberty High School) and Jen Hall, an Optician that works with Dr. Miller. While in the Central American country, they worked with a group of 40 people, amny of whom were locals including several college students that served as interpreters. “The Salvadoran students and the other Salvadoran volunteers are really essential to the project and absolutely wonderful,” John shared. Together, the group provided local Salvadorians with eye care ranging from eye exams, dispensing prescription, fitting reading glasses and even performing eye surgeries. At the temporary Chalatenango Eye Clinic volunteers saw an average of 500 people per day over a two week period. All of the services provided at the clinic are free to residents. “We show up at 7:00 am and there 200 people waiting in line already, most days in brutally hot temperatures! There are many days that we work until 7:00 pm, dispensing glasses and completing the eye surgeries,” said Rich Irelan. Rich and John Medeiros serve with Eye Care International as part of their work with the Olentangy Rotary Club. 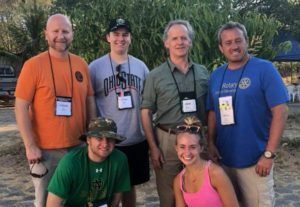 In addition to the eye care assistance, John, for the Olentangy Rotary CLub, travels the country scoping out new locations for the club’s Rainwater CIstern Projects. 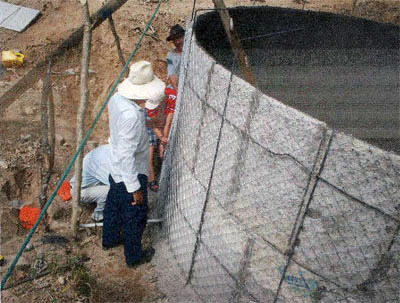 Olentangy Rotary and John are responsible for 50 different rainwater cisterns in Eastern El Salvador. 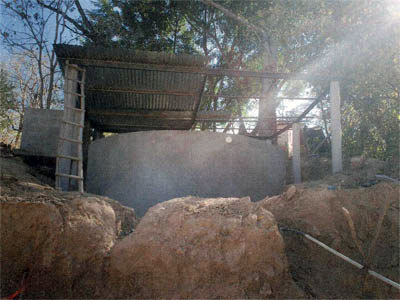 John has also assisted locals in the formation and funding of a cooperative for people in Cacaopera, El Salvador to make hammocks in their homes. This small business is a very important trade, as many residents use these in place of a standard bed. (front row) Jake Miller and Jordyn Irelan. Eye Care International provides vision care to the under-served population of El Salvador. 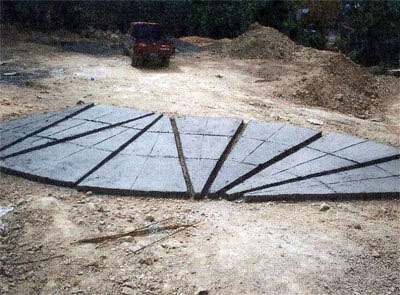 It was founded by Dr. William Brinker in 1995 to bring ophthalmology, optometry, and optical services to areas of El Salvador outside of metropolitan centers. Typically, 5,000-7,000 patients travel to the annual two-week clinic to have their vision checked. They may receive eyeglasses or undergo surgery for cataracts or pterygium removal. Approximately 20 artificial eyes are fitted each year. Each patient is asked to donate one dollar (if they can afford it). However, there are no fees for eyeglasses, surgery, or medications. Each year a group of 40-50 volunteers from the United States and Canada pay for their room and board and airfare to spend two weeks caring for Salvadorans who might have no other opportunity to receive vision care. Volunteers include not only eye care professionals, but others with varied backgrounds who want to help the underserved. One pair of glasses may not change the whole world but it will change that person’s world forever. EyeCare International is an inclusive organization that provides vision services to patients in El Salvador through volunteers who test, treat, and provide eye care services. Seven city of Powell residents recently traveled to Central American with a vision — to help Salvadorans see better. 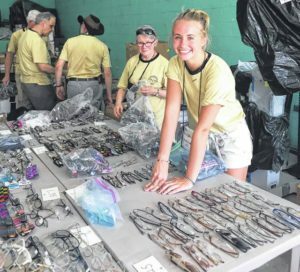 The trip involved members of the Olentangy Rotary Club who teamed up with Eye Care International to provide residents of Chalatenango, El Salvador, with free eyewear and eye exams.